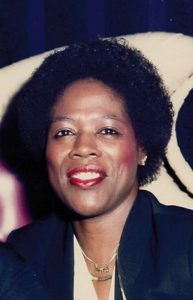 In 1965, Faye Duncan Daniel came to Las Vegas with her husband seeking better opportunities than what they had in Arkansas. She and her husband moved to the Westside where she quickly developed a community of support. She enrolled in an adult education program where she earned her high school diploma and learned typing and other secretarial skills. She soon found full time work at the Nevada Test Site working for Reynolds Electrical and Engineering Company. After leaving that job, she went to work as a typist first for the Las Vegas Police Department and then the North Las Vegas Police Department.Daniel and her husband divorced, and she moved to Boston to be close to family to help her raise her young child. While in Boston, she enrolled at Northeastern University. She did not care for Boston, and soon returned to Las Vegas.After Daniel moved back to Las Vegas, she went to work at the Union Hotel downtown doing check-ins at the front desk. Her skill at the position earned her promotion to Assistant Hotel Manager, the first African-American woman to hold such a position downtown. While in this position, she founded the Hotel Manager Association. She worked at the Plaza for eighteen years, leaving when Jackie Gaughn bought the property. She then went to work briefly at the Golden Nugget. Following her career in the hotels, Daniel decided to return to school, and work on her education. Her interview details the invaluable community of the Westside and the ways in which the residents helped one another. She also describes racism and gender discrimination and how she overcame these challenges.